In this guest article Gedalya from Tamriel.org will be discussing the Mages Guild. He will do so both through an examination of Elder Scrolls (ES) games prior to the Elder Scrolls Online (ESO), as well as ESO itself. Pre-ESO games and accompanying in-game literature we will call lore; we will also refer to in-game literature in ESO as lore.The goal is to provide a breadth first review of the Mages Guild and it’s members with a juxtaposition of the Guild’s representation in ESO and in lore. The Mages Guild has featured since the first Elder Scrolls video game; The Elder Scrolls: Arena. The Guild is reprsented throughout Tamriel, with guild halls well represented in Major cities of the Empire. Headquartered in the Imperial City is the heart of the Guild, the Arcane University. The guild is lead by an Arch-Mage and a Council of Mages. Other comparable institutions include the College of Winterhold in Skyrim, which predates the Guild. Founded in 2E 230, the Mages Guild found its origins in the Psijic Order; which hailed from the island of Artaeum in the Summerset archipelago, home of the Altmer. One of the Psijic Order, Vanus Galerion initiated the Mages Guild. It was in Firsthold, a city in the Summerset Isles that he organized the nascent institution. Fearful of the groups intent, Vanus was brought before is mentor Iachesis and the King of Firsthold Rilis XII with demands of explaining the groups intent; which he did and so successful was he that he was awarded a charter for the guild. An exception to these accounts from the OMG, is information in the Mages Guild Charter (MGC) stating the Guilds creation by Vanus and Rilis XII. The Mages Guild provides a variety of services to members and non-members; however this has included services related to Alchemy, Spellcraft, and Enchanting. The Guild is often portrayed in a benign and politically neutral fashion; with interests shown in some cases as favoring local populaces when the Guild’s services can accommodate them. Ostensibly each guild hall operates in a semi-autonomous fashion in order to maintain the best local relationships possible. Early on the Guild found the need for protection; a need from which the Knightly Order of the Lamp resulted. The Order’s purpose involved protecting the Guild in hostile areas. The Order aided Vanus Galerion when he confronted Mannimarco in the early days of the Guild; albeit after Galerion had left the guild due in part to his disgust with the bureaucracy that had evolved to govern it.In the work Mannimarco, King of Worms, the fate of the Order can be surmised as it appears that few lived to tell of it. Although the information is dated, most notably with regards to the Order of the Lamp it is still instructive. It wasn’t until the year 2E 321 that the Mages Guild became a legal institution in the Empire; when the “Guilds Act” of Potentate Versidue-Shaie was recognized as sanctioned legislation. The Guild encourages growth in four schools of magic: Destruction, Alteration, Illusion, and Mysticism; along with enchanting and alchemy. Necromancy is forbidden for members of the Mages Guild. In particularly, advancement in the Guild specific skill line in ESO is done by means of the collection of lore books. 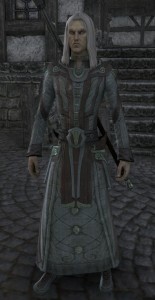 There is a whole quest line in ESO for the Mages Guild; it is interesting as it involves Shalidor, who is attributed with creating the College of Winterhold; a competing institution, which unlike the Guild has not made Necromancy forbidden. Eyevea in Elder Scrolls Online. Specifically ESO takes place on and around 2E 582. All other Elder Scrolls games take place after this beginning with Arena in the third era. While ESO is fairly consistent with the preexisting descriptions of the Mages Guild in other Elder Scrolls games, one question remains: in ESO players gain access to a location called Eyevea, a haven for Mages access through the Mages Guild quest line. This location is notable if only because of it’s absence in all other ES games even by reference. While areas located in Oblivion are accessible via story lines throughout the Elder Scrolls franchise, other locations in Tamriel proper are limited only by the extent of the actual main story line in each Elder Scrolls game. Eyevea would seem a place that one should have access to in prior Elder Scrolls games by means of the Mages Guild; it’s absence is curious, leading one to ponder what became of it. The Mages Guild quest line in ESO revolves around several figures; for this article, the mage Shalidor is most notable. Shalidor is represented in prior Elder Scrolls games; Shalidor is noted in several works in the Elder Scrolls V: Skyrim, and a statue of him can be seen in the same game. 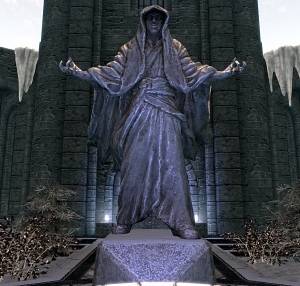 Statue of Shalidor at the College of Winterhold in Skyrim. While MMSL notes that a number of the legends surrounding Shalidor are exaggerated or fabricated, none are specifically noted. It further notes that in addition to being responsible for the formation of the College at Winterhold, he held the belief (as did others) that spell-craft should not be a hobby or idle pursuit but rather the subject of serious study. Further, the work MMSL focuses on the Labyrinthian: a maze acting as a test for mages attributed to Shalidor. Shalidor’s creation of the College of Winterfold, which is not associated with the Mages Guild, might imply a detachment from the Mages Guild; but this is hardly precedential. In fact Shalidor’s central involvement in the Mages Guild quest line in ESO easily reinforces his stature. Winterhold was absent with the launch of ESO; it’s inclusion in the future may prove fascinating with regards to the College of Winterhold and Shalidor. The main quest line in ESO will bring the player into Coldharbour; prior to this, and once in Coldharbour, there are interactions and quests involving Vanus Galerion, the founder of the Mages Guild. Galerion’s presence in ESO is overshadowed by that of Shalidor if one plays through both the main quest and Mages Guild quest lines. “Mages Guild.” Elder Scrolls. Wikia, n.d. Web. 3 Aug. 2014. <http://elderscrolls.wikia.com/wiki/Mages_Guild>. “Psijic Order.” Elder Scrolls. Wikia, n.d. Web. 3 Aug. 2014. <http://elderscrolls.wikia.com/wiki/Psijic_Order>. “Artaeum.” Elder Scrolls. Wikia, n.d. Web. 3 Aug. 2014. <http://elderscrolls.wikia.com/wiki/Artaeum>. “Origin of the Mages Guild.” Elder Scrolls. Wikia, n.d. Web. 4 Aug. 2014. <http://elderscrolls.wikia.com/wiki/Origin_of_the_Mages_Guild>. “Mages Guild Charter.” Elder Scrolls. Wikia, n.d. Web. 4 Aug. 2014. <http://elderscrolls.wikia.com/wiki/Mages_Guild_Charter>. “Lore:Order of the Lamp.” UESPWiki. 14 May 2014. Web. 6 Sept. 2014. <http://www.uesp.net/wiki/Lore:Order_of_the_Lamp>. “Lore:Mannimarco, King of Worms.” UESPWiki. 30 June 2013. Web. 6 Sept. 2014. <http://www.uesp.net/wiki/Lore:Mannimarco,_King_of_Worms>. “Guilds Act.” The Elder Scrolls Wiki. Wikia. Web. 6 Sept. 2014. <http://elderscrolls.wikia.com/wiki/Guilds_Act>. “Reading the Future of the Past in the Elder Scrolls.” Elder Scrolls Online. ZeniMax Media Inc., 18 Oct. 21012. Web. 8 Sept. 2014. 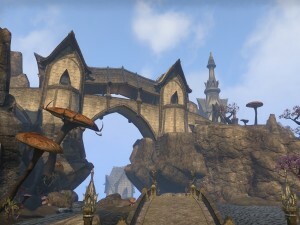 <http://www.elderscrollsonline.com/en-us/news/post/2012/10/18/reading-the-future-of-the-past-in-the-elder-scrolls>. “Shalidor.” Elder Scrolls Wiki. Wikia. Web. 29 Oct. 2014. <http://elderscrolls.wikia.com/wiki/Shalidor>. “Sheogorath.” Elder Scrolls Wiki. Wikia. Web. 29 Oct. 2014. <http://elderscrolls.wikia.com/wiki/Sheogorath>. “A Minor Maze: Shalidor & Labyrinthian A Brief History of Labyrinthian.” The Unofficial Elder Scrolls Pages. 7 Mar. 2013. Web. 29 Oct. 2014. <http://www.uesp.net/wiki/Lore:A_Minor_Maze>.